Video by UK Public Relations and Marketing. To view captions for this video, push play and click on the CC icon in the bottom right hand corner of the screen. If using a mobile device, click on the "thought bubble" in the same area. LEXINGTON, Ky. (July 11, 2016) — More than vegetables and herbs are grown in the small garden adjacent to Arbor Youth Services’ emergency shelter on West Third Street, Lexington. This particular garden is blessed by more than sunshine and rain; it’s made fertile with the hopes, dreams, faith and goodwill of the homeless teenagers who tend it. None of it would exist without the inspiration and devotion of one University of Kentucky freshman who dreamed of making a difference. He applied for and won a $1,500 grant from Clinton Global Initiative. He chose his objective, the Arbor Youth Services’ Metro Alternative Shelter House, or “MASH House” to its young, temporary residents. When Beau Revlett first appeared one early spring day on the MASH doorstep to present the full scope of his desire to help the facility, its executive director, Ginny Vicini, was less than enthused. The UK student’s plan was to resurrect a garden that had laid fallow for years in the side yard of the old house. He proclaimed the garden could feed the homeless youngsters who stayed at Arbor and hopefully give them a bit of pocket money by selling any excess bounty at the local Farmers Market. “To be honest, when I first picked up a shovel and hoe to clear the weeds that grew over my head — and I’m 6’3”, so they were impressive weeds — I wasn’t sure myself if this would work,” said Revlett, who will be a sophomore honors student at UK this fall, majoring in philosophy with a minor in French. But he persevered, showing up nearly every day to clear the land for planting. At first, he was alone in his labors; no one walked out of the house to join him. “One day, I thought, I’m only doing half my job. I’m working on the garden, but I’m not helping the kids,” remembered Revlett. 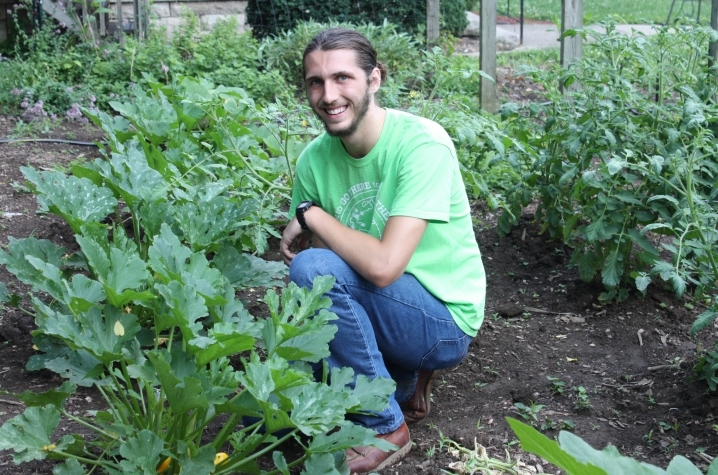 “I knew it was not going to be easy getting our kids involved in the garden,” said Vicini, adding that Arbor has a drop-in center for teenagers and young adults as well as residential services for homeless infants and toddlers, as well as middle and high school age young people. Last year, Arbor’s MASH housed 350 children, ranging in age from a few months to mid-teens. Their stays ranged from 24 hours to three months. Many of them are runaways “committed to the cabinet, what we used to describe as wards of the state." The next time he visited, instead of picking up a hoe, Revlett walked inside and introduced himself. It took a while, but eventually Revlett got conversations started. “It just took a little time,” he said. “Most of them are only a few years younger then me, so we eventually found some common ground. Slowly, but surely they came around. Then, one day I stopped by and there were five of them already out there, weeding. That was a good day,” he said with a shy smile. Tended by Arbor’s temporary residents and drop-in visitors, the garden is flourishing, now heavy with squash, peppers and ripening tomatoes. The peas got in the ground a little late and did not do well. The cucumbers failed, but the carrots seem to be making a comeback. “Beau’s concept is just an incredible unique way to engage our young people and our staff. It’s therapeutic and has grown into something we can use — both financially and as food for our residents. Beau’s enthusiasm is infectious for both our kids and our staff, and we are just very, very grateful." That doesn’t mean Vicini is allowing her young volunteer to “escape.” He has recently accepted a position on Arbor Youth Services’ board of directors.